It ain't fancy. It is fun. 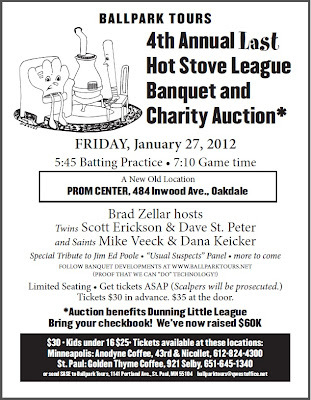 If you're looking to get together for a lot of irreverent and fun Twins talk, I'd invite you to attend the 4th Annual LAST Hot Stove League Banquet and Charity Auction next Friday night. It's not the fourth annual - it's the fourth annual LAST, because this has been going on for decades now and they keep trying to stop doing it. You'll likely see both The Voice of Reason and I there and we'll probably be taking the party someplace else immediately afterwards. I hope you can make it.